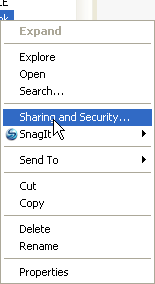 Right-click on the folder and choose 'Sharing and Security'. After clicking on this warning you need to confirm this action. Select 'Just enable file sharing' and click on OK. The tab 'Sharing' is displayed again with additional options. 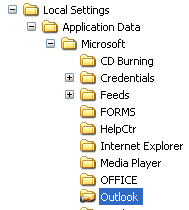 Check the option 'Share this folder on the network'. 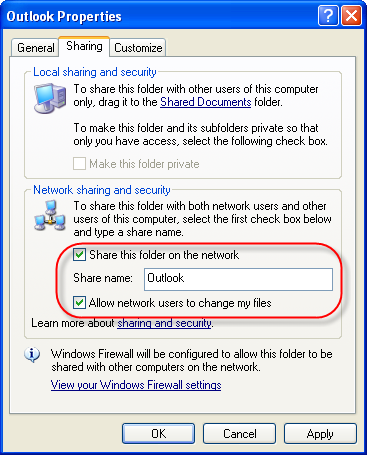 Enter a name in the text field 'Share name' and finally check the option 'Allow network users to change my files'. Click on 'OK' to close this window. It's a good advice to create your users on all your computers with the same name and password. This way you can access easily the files on the other computer.